Yesterday I shared our updated closet, and before the fam started tossing their goodies into those amazing new drawers, I wanted to do something a bit special. 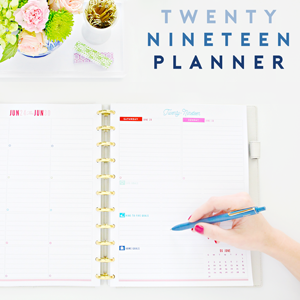 I use pretty papers and drawer liners with majority of my organizing projects, which spurs a constant stream of question on the topic. 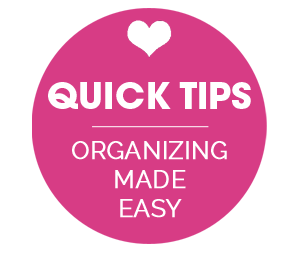 So I thought I would touch on those items briefly in this week's Quick Tip Tuesday! 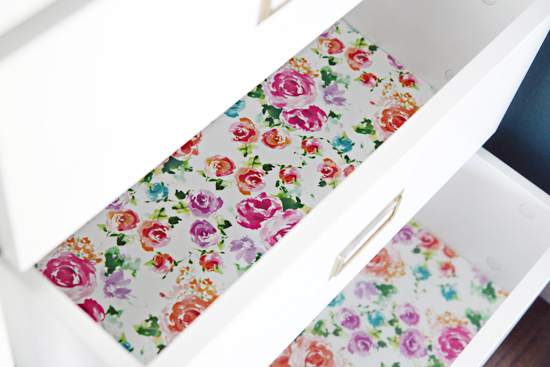 WHERE DO YOU FIND PRETTY DRAWER LINER? Everywhere! Amazon has a pretty selection of MacBeth Collection patterns, which I also occasionally spot at HomeGoods/Marshalls. 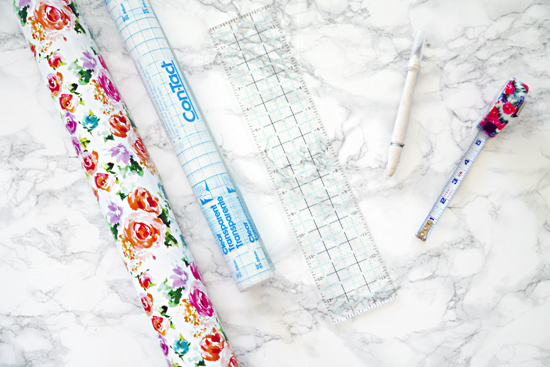 I am still loving and using my marble contact paper frequently for all sorts of projects, and even the dollar store has come through at times. Michaels and Target occasionally sell small rolls for around a dollar or two in their hot spot bins. And I recently discovered Chic Shelf Paper and can't wait to try out a few of their playful patterns in my kitchen. If I can't find exactly what I am looking for, I make some! More on that in a moment. WHERE DO YOU FIND PRETTY GIFT WRAP? HomeGoods/Marshalls/TJ Maxx are my "go to" spot for pretty gift wrap. I also love Paper Source, Target and smaller, locally owned boutiques. HOW DO YOU KNOW WHICH TYPE OF PAPER TO USE ON YOUR PROJECTS? It really depends. If I am doing something that won't receive a lot of wear and tear, I just go with straight gift wrap or decorative scrapbook paper. 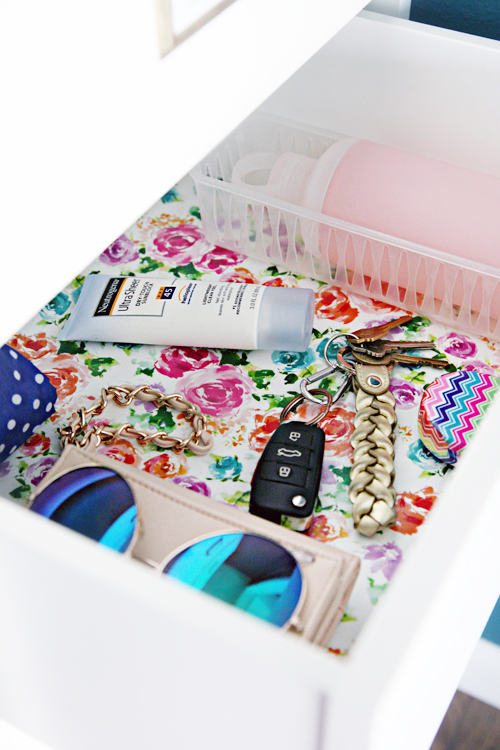 A quick lining of a tray, covering a pretty box, junk drawer organizers, etc... If something will be in contact with anything wet or is in need of an occasional cleaning, I opt for shelf liner. Typically shelf liner is my jelly jam for kitchen/bathroom cabinets and drawers or to cover storage boxes that will receive a lot of love. 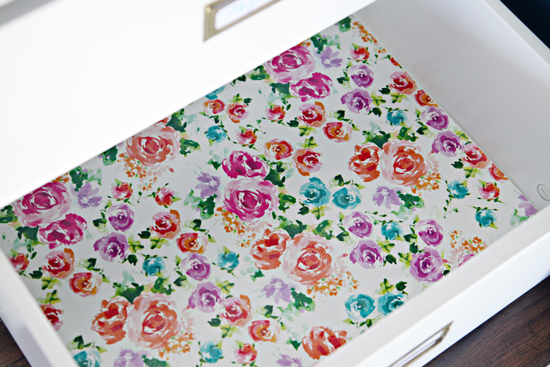 I wanted to line the drawers, but instead of using any of the drawer liner I had on hand, my attention was on some gorgeous, floral gift wrap that has been making my heart turn into a dancing gazelle since seeing it in Aniko's contributor post. And a huge shout out to my dear friend for picking up the gift wrap from Target for me, since I am still on a Target break. However, as I mentioned above, wrapping paper does not make good drawer liner in high traffic drawers. Quick fix? Clear contact paper! To use any wrapping paper that you love as drawer liner in any climate or room, simply add clear contact paper to the top. 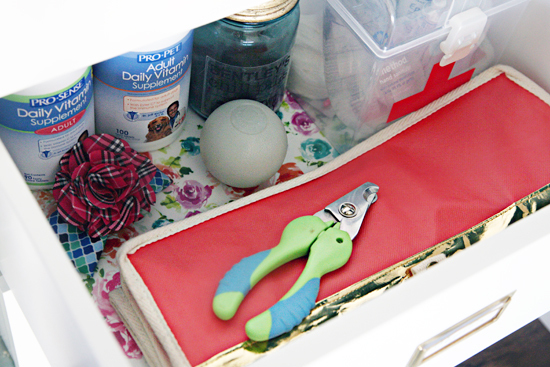 Drawer protection with a wipe-ability factor! 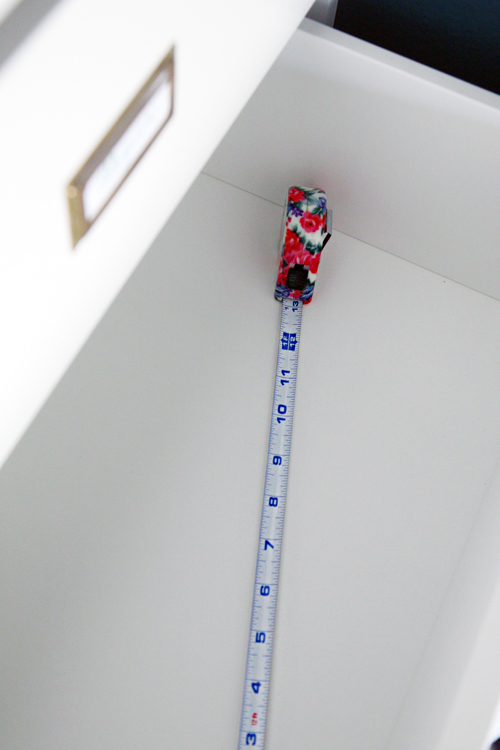 To get started, I took measurements of the interior of the drawers. I found it was really helpful to use an over-sized cutting mat to make my cuts and work with the gift wrap/adhesive contact paper. I also used a craft knife (a rotary tool also works great) and a straight edge ruler. I tried this process two ways and both seemed to work just as well. First way was to simply place the contact paper over the top of a strip of gift wrap, affixing it to the cutting mat to hold it in place while I unrolled it over the paper. Once the paper was covered, I measured and sliced it down to the correct size with my craft knife and straight edge. I did find that my craft knife cut the paper better with the contact paper over the top first. When I tried it the second way by pre-cutting/measuring the gift wrap first and then adding the paper over the top second, the gift wrap would occasionally catch on the knife. And that is it! Simple as can be. I left a small bit of the clear contact paper on each edge of the gift wrap, to offer a small bit of grip to the bottom/edges of the drawers and to prevent any paper wiggling. 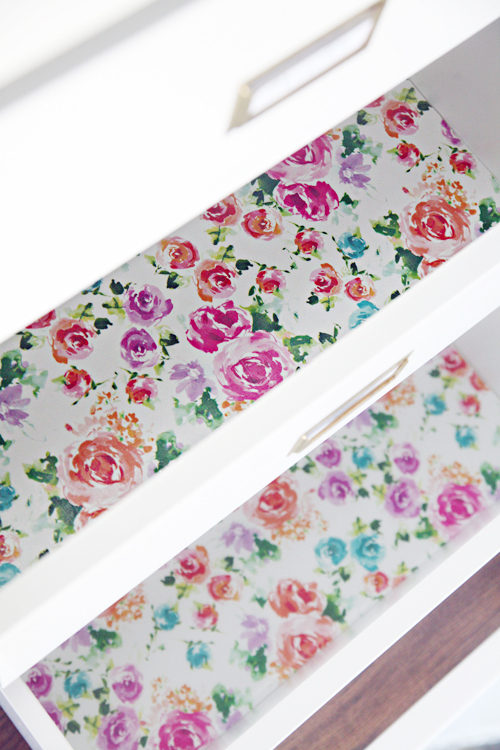 I mean seriously, how pretty are those drawers now?! I am GUSHING! As far as organizing them? I am not doing much. I know, the horror! 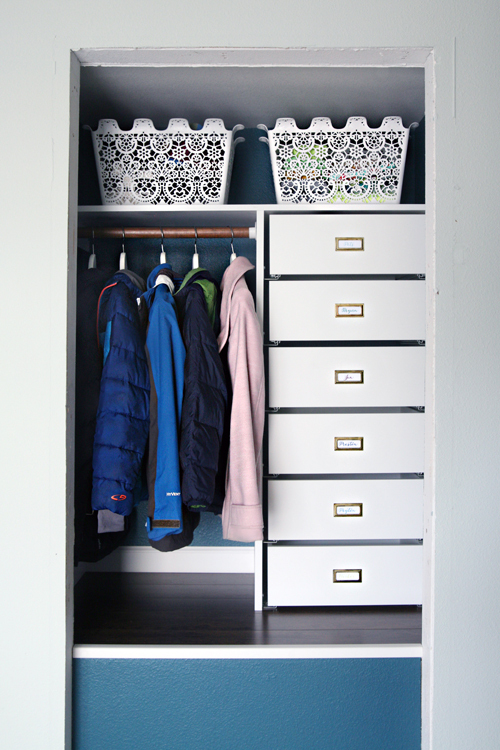 But seriously, the goal for the drawers is to act as little clutter catchers that conceal daily messes. I fully expect my kids to just open them up, toss in their contents, and move on with their day. Heck, I will be doing the same. In my drawer, I am keeping things like my small clutch, sunglasses, keys, a reusable shopping bag, sunscreen, mini tape measure and water bottle (which I did place in a drawer organizer to prevent it from rolling around). My gloves would normally be tossed into the mix, but they were the vehicle my husband took to work today. Basically anything that I use each day when I am on the run. The boys will use the drawers to hold their hats and mittens, baseball caps, water bottles, lunch totes, etc... I also put together our pet's drawer to hold some of their personal care items (leashes live on hooks in our garage). Quick, easy and fabulous. That is how I turn beautiful gift wrap into beautiful, cleanable drawer liner! Love this idea! Thank you for the share! It's ingenious to use the clear contact paper over the gift wrap - I want to do this in our white shelves in our coat closet. What a happy place for clutter!!! 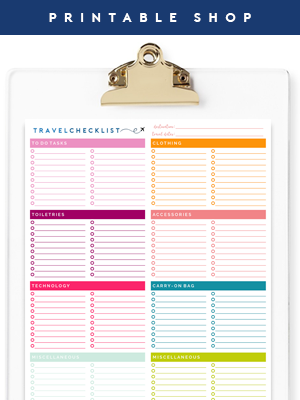 Can't wait to check out all your contact paper sources! Great tips, thanks. Adorable and practical too. Love it! These papers are so pretty! I'm off to check amazon. Our living room drawers need jazzing up a little. You have inspired me to keep my eyes open for cute gift wrap to be used for more then just gift wrapping! Can't wait to check out target next time I'm there!! I love the white baskets!!! Can you share the source for thoese? They are called the Carrie Bicycle Basket if you are looking for additional info. I love the idea of using contact paper over wrapping paper! I've beeen using gripped drawer liner and find it really isn't helping much. I'll definitely try this! 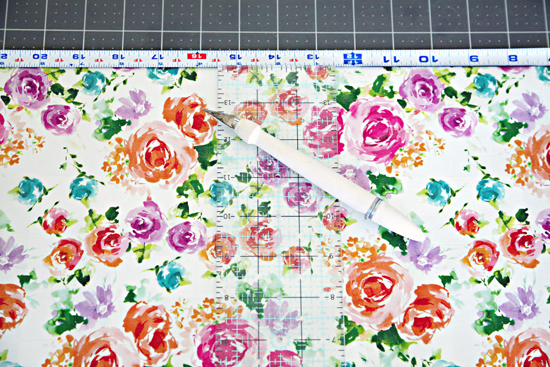 Love this floral print gift wrap - so beautiful!! The floral paper is so lovely!!! I really love the way it compliments the dark closet. I'm curious what your boys thought!! Did they mind having florals in their personalized drawer? My comment was in line with Alise's comment - about floral paper for the boys' drawers... I like your response Jen! 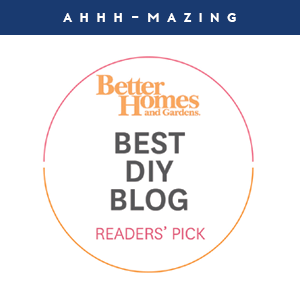 This is great - and imagine my "horror" that you weren't going to organize the drawer contents! Then I saw that you did organize your drawer. Such a great idea!!! Clear contact paper over gift wrap! Oh, the possibilities! I have used wrapping paper to line drawers as well but rather than Contact Paper, my favorite thing to do is take them down to my local teaching supply store and have it laminated. This protects it on both sides and it will last forever! It also wipes clean very easily! head...think I will try it!! Love it Jen! 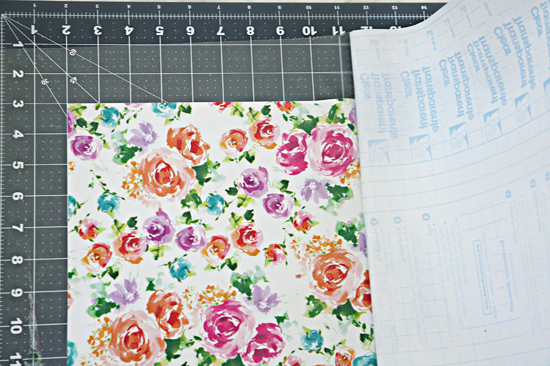 My contact paper always ends up bumpy so I like the idea of the cutting mat! 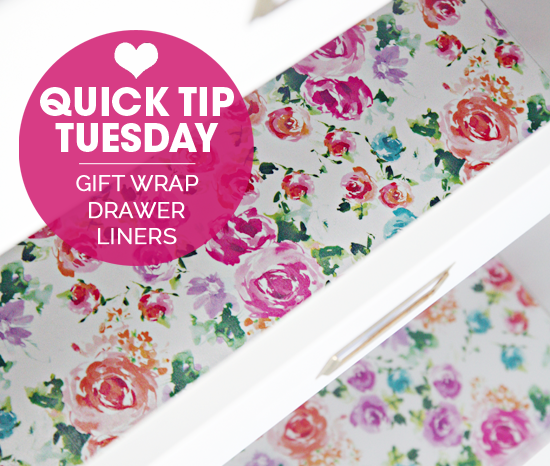 I love the idea of using the wrapping paper for the drawer liners. I don't understand how you adhere the paper to the drawer. Do you leave a strip in the back to adhere it to the drawer from the contact paper? Wish there was a better visual for this step. I placed the contact paper over the gift wrap with enough contact paper overlapping all edges of the wrap. This allowed me to leave a small sliver of the sticky contact paper around each edge, which helped to hold the paper in place within the drawer. This is a beautiful liner! But how do you keep the paper down in low traffic areas when you don't use contact paper? This is giving me some great inspiration! I need to add new lining to the drawers in my bathroom. Love the idea of using a fun pattern. Such a cute, pretty idea! You could use old maps or wallpaper. Saves new paper and resources being used. And money! There are vitamin tablets for dogs? Doesn't the dog food supply those needs? This is such a wonderful idea! 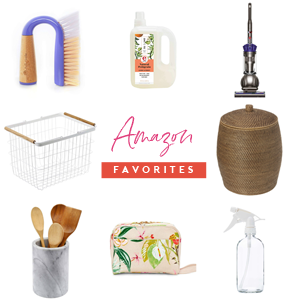 I'm definitely going to spruce up my drawers! Yesterday I found 18inx24ft clear Con-tact paper at Big Lots for only $5! Can't wait to try this out! The floral paper is from Target a few months ago. :) I am not sure if they still stock it, but hopefully you can track some down, it is quite pretty! Love it! Several gift wrapping paper designs really caught my eye at Paper Source a few years ago, and I've used them as wall art ever since. One of them is just a blue & white polka dot piece, but I love the navy color so much that I purchased a third to use in my college bedroom. There are 2 hanging on the walls in my fairly minimal bedroom which I find adds a playful & feminine touch. One is against my closet door because the off-white color frustrated me but as a nomadic apt renter I don't have the desire to do a painting job. The inside of the drawers in my bathroom have a beige floral print that I don't like. It'd be so refreshing to see a different design when reaching for tools I use every day. Thanks! I love that the process of using the clear contact paper makes the choices that much more endless! Do you look at this as more of a permanent solution? I have cabinets in my bathroom that we recently painted and would love to dress up the bottom of the shelves. i was thinking that the contact paper might pull up the paint tho, if i decided to change it. Any ideas or thoughts on this? Hi Emily! 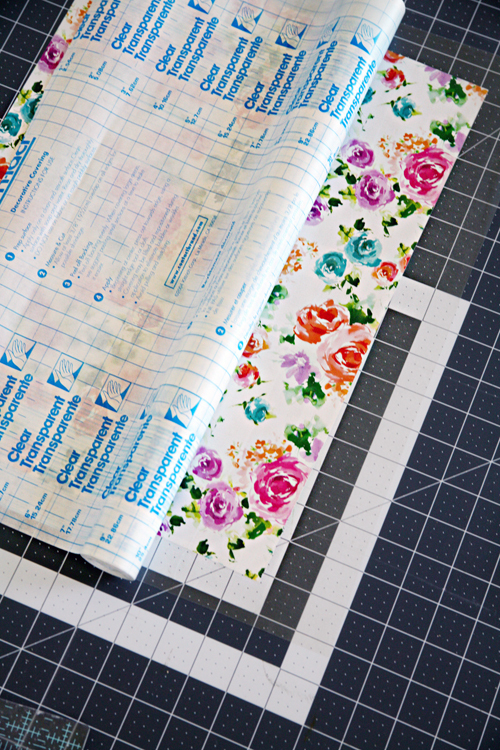 One of the reasons I love contact paper is because it is generally designed to be a temporary solution (as in it shouldn't leave residue or cause damage when removed). If you are planning on adding it to a painted surface, I would just be sure that the paint has had the proper time to cure first.